Credit unit at rest. See picture number nine for green cover. The springs are attached in this picture but will be disconnected in the next images to allow pictures to be taken. The increment solenoid, in the lower left starts to pull in, rotating a lever that will start to turn the star wheel. The star wheel is connected to the one's digit wheel. The star wheel has rotated half way, from 128 to 129. The index pawl is raised to the top of a star point, in the upper right. This pawl makes sure the digit is centered in the window. The index pawl has now fallen into the next star valley, pushing the 9 digit to the center of the window. 129 is now showing. The increment solenoid is released, and the levers are returned and await the next activation. Note the small, white star gears to the left of the digit wheels. The teeth are alternating full and half width and so far they have not rotated. Now the count will go from 129 to 130, requiring the ten's wheel to rotate. The increment solenoid starts to pull in. 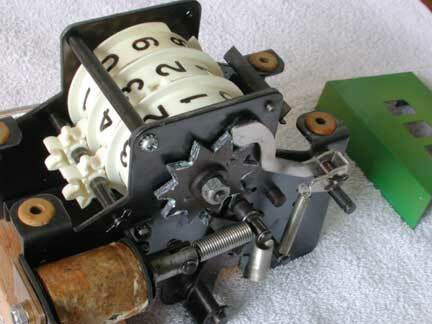 The lever is moving the star wheel as before, but now the the white star gears at the left will fall into the gap between 2 and 3, causing the ten's wheel to rotate as well. As before the index pawl will center the digits in the window. The full width tooth on the star gear has again passed through a gap between 2 and 3, and is now waiting for the next full rotation. The objective of the coin counter is simple, to count the number of credits or tokens or coins won. The counter displays the count on rotating drums, with only one number showing through a window. The count can go up one at a time or down, one at a time.